Welcome to the final week of the Christmas Open House Party! Share your family’s traditions – new, old, crazy. Every year, we get a tree. We used to get the tree pretty early in December. Now I find the date to get the tree has moved closer to Christmas partially because of my daughter’s birthday and family party in early December. We’ve been almost everywhere to buy a tree, though we’ve never cut our own. Every year, my husband throws out suggestions for different types of trees. It’s a pointless discussion because I know he wants a Doug Fir. We always get the Doug Fir. I think this year’s trip for the tree was the best so far. We took the kids one weekday night after dinner and went to the spot in front of our township’s swim club. After driving the guy helping us nuts by looking at about a dozen trees and discussing their merits (it IS a disposable tree), we agreed on one and watched as our tree was bundled up for the car ride home. The man selling the trees is a local guy and quite entertaining with his Donald Duck impressions. I caught my teenager trying do the Donald a few days later. Then we started a new tradition – visiting the lights at a local house. Every year, a local tax preparer fills his yard with light displays somewhat organized by category. 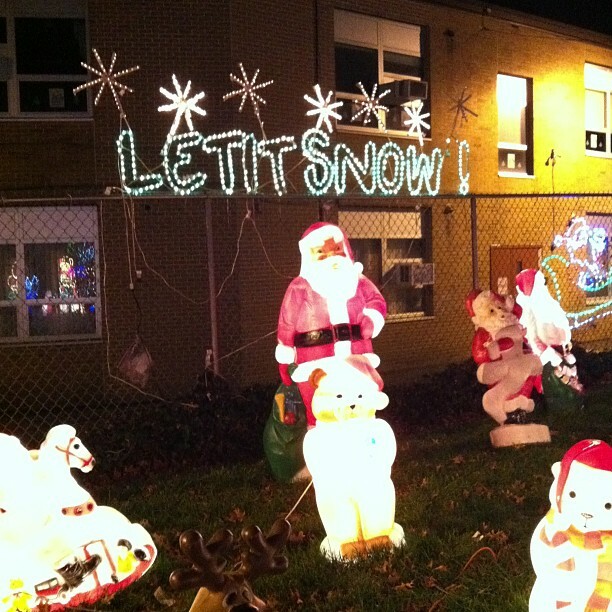 The display is free, though he collects donations for the local food pantry. Let’s see what happens next year when we get our tree. We always go after Christmas eve service to look at light one entire town puts out illumines so pretty. When it comes to trees , I could not tell them apart, we opted for a prelit fake tree a few years back still looks nice though a stand went out this year. Every year, since my oldest was 2…we send off Blue Bear & Bailey (2 identical blue bears, who happen to be cousins…with one from the North Pole) in one of our kids toy vehicles to head to the North Pole, visit with Santa and deliver our letters. They are usually gone for about 2 weeks and always bring back a cool treat or present for us all. They ofyten come back with snow on their tires and in their car as well (lol). You see these special bears have been “coming alive” for 10 years…you never know what they have been up to, we find them all over, on film and even on video. My husband always says I should have marketed it and instead of elf on a shelf it would be a blue bear lol!! Happy Holidays!! I really want to go back to having a real tree vs. a fake one – next year for sure! I think it’d be fun to have the kids help pick out the ‘perfect’ tree. Love that you discuss the merits of them… 😉 Merry Christmas to you and yours! 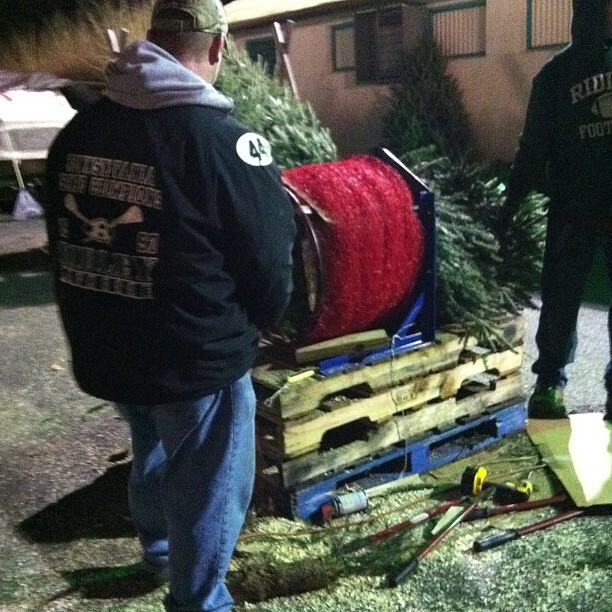 Getting our Christmas tree is one of my favorite family traditions too! What beautiful memories you are making. How fun to have a local light display so close that you can see too. I used to go through a drive through light display every year when I was a child, so we are thinking about starting that this year with my kids. I came back and linked up now that I have a ‘traditions’ post! 😉 Have a great weekend, Barb – and a Very Merry Christmas! Thank you and you, too!